The Ministry of Drinking Water and Sanitation has formulated the Rural Sanitation and Hygiene Strategy for the period of 2012 to 2022. The main purpose of this strategy is to provide a framework to realize the vision of Nirmal Bharat, an environment that is clean and healthy. 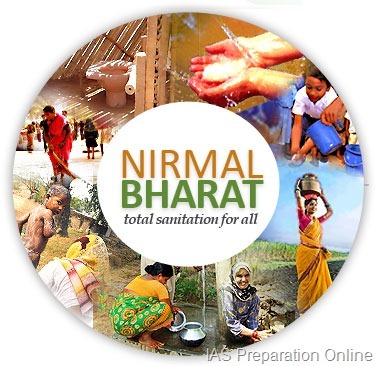 A Nirmal Bharat is a dream of clean and healthy nation that thrives and contributes to the welfare of our people. This vision seeks to visualize a nation in which the traditional habit of open defecation is entirely eliminated, the worth of every human being is respected, and quality of life is improved. To achieve this in rural areas, the department has following strategies and goals to meet in coming years. Completely eliminating the traditional habit of open defecation and making this a relic of the past. Operationalizing systems for the safe management of solid and liquid waste at scale. Promoting the adoption of improved hygiene behaviours. Addressing inequalities in access with special attention to vulnerable groups such as women, children, aged and disabled. Ensuring that providers have the capacity and resources to deliver services at scale. Stimulating and enabling cooperation across public sector agencies concerned with rural development, health, environment and vulnerable sections. Working with business, academic and voluntary partners to achieve the goals of the strategy. Creation of Totally Sanitized Environments – By 2017: The end of open defecation and achievement of a clean environment where human faecal waste is safely contained and disposed. Adoption of Improved Hygiene Practices – By 2020: All people in the rural areas, especially children and caregivers, adopt safe hygiene practices during all times. Solid and Liquid Waste Management – By 2022: Effective management of solid and liquid waste such that the village environment is kept clean at all times. The Central Rural Sanitation Programme of the Indian government began in 1986. It has now evolved into the TOTAL SANITATION CAMPAIGN-(TSC) which operates in various districts of States and Union Territories. TSC successfully encourages households to finance their own toilets while giving financial incentives to the underprivileged. A nationwide network of Rural Sanitary Marts and Production Centres has been established with government funds though they are run primarily by local governance, NGOs and community based organisations. These Marts and Production Centres provide the materials required for construction of sanitary latrines and other facilities. The outlets also serve as counselling centres for those interested in building a toilet on their own. This has boosted the supply chain, promoting sanitation and hygiene, catering to an estimated 138 million rural households in the country. Lessons from three decades of a government-driven programme suggest that visionary policies and a strong institutional setting helped in reaching more households without toilets. Although progress has happened, models in West Bengal, Maharashtra and other places show how informed strategies, strong peoples participation and strong monitoring yield results. Thus, the government has also put in efforts to focus on improvement of sanitation facilities in various schools, Anganwadi centres and communities. To bring sanitation to the forefront of social and political discourse for development in rural India. To develop open defecation free and clean villages that will act as models for others to emulate. To give incentives to PRIs to sustain the initiatives taken by them to eliminate the practice of open defecation from their respective geographical area by way of full sanitation coverage. The 2.6 billion people, 40 per cent of the world’s population, still do not have access to toilets or latrine that is why sanitation is one of the key subjects in the United Nations Millennium Development Goal targets. The UN-backed Sanitation for all: the drive to 2015 aims to mobilize political will and collect resources to expand sanitation facilities across the globe. In 2001, the World Toilet Organization (WTO) declared 19th November as a World Toilet Day (WTD). The WTO created the WTD to raise global awareness of the struggle 2.6 billion face every day without access to proper and clean sanitation. The WTD also highlights the health, emotional and psychological consequences the poor endures as a result of inadequate sanitation. The WTD‘s popularity is gaining momentum, and in 2010 there were 51 events on sanitation facilities spanning 19 countries. holds true these days, and that is certainly diet program andd physical exercise. Excessive weight creates flab, which can typically accumulate around the neck. This in turn adds for the difficulty.